In the pantheon of names we’ve covered as we wend our way through the history of Magic: the Gathering via its preconstruced decks, Matt Cavotta is one we’ve not touched upon but that might be recognisable to players of different eras. Presently the Senior Creative Art Director, those who attended or otherwise watched the Magic panel at the most recent San Diego Comic Con would have seen him discussing the topic of art (and Dwarves) in the game. Responsible for the art of over 175 cards across a wide number of sets, those with longer memories might also recall that he helmed a weekly feature on the mothership from early 2005 to nearly the end of 2007 that concerned itself with the creative aspects of making the game. As we lead into the final deck of Magic 2013, the White/Blue Path to Victory, we find ourselves coming full circle with one of Matt’s most famous pieces, Snack Time with Vorthos. This was the first time that the “psychographic” of Vorthos entered into Magic’s public discourse, though it would hardly be the last. Since then, the notion of a Vorthos as a player who enjoys the flavourful aspects of the game, from the art to world building and right on down to the text on the cards, has become firmly entrenched in Magic’s consciousness. First given life in 2005, Vorthos lives on still. And not just lives, but thrives! 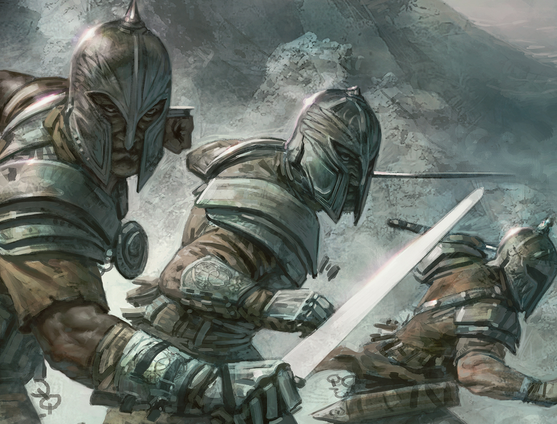 Gathering Magic writer Mike Linnemann coined the term “Vorthos Wednesday” to describe the site’s weekly featuring of art and story-centric articles in May of 2011, and while he has since taken his leave of regular Magic writing the term has stuck. Nor has catering to the Vorthos mentality been limited to non-official sources. While the mothership has long had features and articles that covered the more creative aspects of the game, from (the now defunct) “Savor the Flavor” to the many Planeswalker’s Guides, we’ve seen an apparent increase of attention to flavour in the way R&D designs sets- Innistrad being a perfect example. We’re also increasingly seeing little touches like the flavour text of Fungal Sprouting, which refers to a legendary creature created for last year’s Commander releases. And with a recent restructuring of the mothership, we’ve seen the addition of a new weekly feature on- when else- Wednesdays. Jenna Helland’s Uncharted Realms feature kicked off on 27 June, with the stated aim of giving a fictional look at a story contained within a single card each week. Subsequent weeks have seen tales from the Xathrid Gorgon to Ravnica’s Krenko, Mob Boss and beyond. The very first of these, however, was a tale about a figure from Innistrad- and the featured card in today’s deck. As we’ve seen with most of the other Magic 2013 legends featured in the Intro Packs, Odric, Master Tactician is a build-around-me card. In order to get the most out of him, you’ll need to ensure that you’re letting him lead if not an army, at least a skirmisher’s band. Towards that end, the deck features a host of early plays and peaks at the three-drop slot, while still providing some effective finishing options should the ground game stall out. As we’ll see, there’s also a minor lifegain subtheme that can put games out of reach against more aggressive, burn-minded opposition. The deck begins with a pair of Chronomatons, somewhat versatile if plodding 1/1’s that have the potential to be useful later in the game- but only if deployed early enough. Those clamouring about power creep over the years of the game will surely take note of the Chronomaton in comparison with Tempest’s Energizer. The deck begins to pile it on with its selection of two drops. A trio of Silvercoat Lions– solid 2/2 beaters- look somewhat mundane when paired with the three Ajani’s Sunstrikers, but that’s an indication of what the extra coloured mana can buy you. With six in the deck, you’ll see one or the other on most opening hands. It’s not until the three-drops, however, that the deck really comes alive. A trio of Attended Knights give you solid value for mana, offering three power over two bodies. This becomes particularly relevant wither another creature here, the Crusader of Odric. Ordinarily creatures like this- those that derive their power from certain permanents on the board- can tempt you to overcommit your hand, leaving you susceptible to getting blown out by a timely sweeper (see: Mutilate). In this preconstructed environment, however, you can play with little such trepidation. Blue weighs in here with a few offerings of its own. The obligatory air force kicks off with a pair of Arctic Avens, part of a cycle of creatures in Magic 2013 that gain a “Kird Ape” style bonus from having the right type of land in play. Since the deck is overwhelmingly White, you’re almost assured of having at least one Plains in play by your third land drop, making this Aven a superb value as a 3/2 flier for three mana- with the option of lifelink. Finally, the Courtly Provocateur fills the role played by the Alluring Siren in previous years. Although she costs one more than the Siren, she brings an extra dose of utility by being able to force blocks as well as attacks. Moving into the four drops, we find additional aerial options in twin Griffin Protectors. Another new card for Magic 2013, the Protector gets a temporary buff if you summon creatures to the battlefield in your first main phase. This is not without cost, however, since it does give your enemy extra information upon which to base any defensive decisions. The lifegain suite is bolstered by the inclusion of a couple of Healers of the Pride. A sort of jumped-up Soul Warden, played early enough the Healers can net you a tidy packet of life, and a 3-toughness body is certainly relevant. The final creature here is our main man, Odric, Master Tactician. Odric brings tremendous power to bear for his cost. In addition to a 3/4 first striker, he can close out games if you have enough bodies on the board by denying your opponent the ability to block. You can also turn combat into a one-sided blowout by opting to throw your opponent’s creatures into disadvantageous blocks. Either way, many a game will turn upon bringing this Innistrad native into play. The deck’s final four top-of-curve beaters all add to the deck in different ways. Serra Angel is a classic inclusion, while the Battleflight Eagle offers a smaller body in the air that brings along a one-shot buff when it enters the battlefield. Faerie Invaders offer one last skyward option, with the added benefit of being able to surprise your opponent thanks to flash. Lastly, the deck’s other rare card, Captain of the Watch, slots in perfectly here. The Soldier tokens she brings with her aren’t just solid in their own right, they’ll also net you a ton of life (with Healer of the Pride), buff up the Griffin Protector to substantial proportion, and turn a similar trick with the Crusader of Odric. As an added bonus, since Odric himself counts as a Soldier, he too benefits from the power/toughness boost and vigilance, making them a very deadly duo indeed. 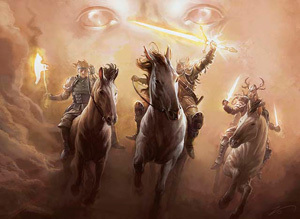 However impressive the deck might seem on the battlefield, the noncreature support is a bit tepid. An Oblivion Ring offers solid removal, though as a singleton its appearance cannot be relied upon. More steady are the pair of Divine Verdicts, but these are conditional and rather pricey options. Temporary removal is afforded in Downpour, another card new for the set, which can both pry open an opponent’s entrenched defenses as well as buy you time if your opponent has the upper hand in the red zone. As you’d expect in White, there are a couple of combat tricks as well. Glorious Charge is a cheap way to buff your whole side, and is useful on either attack or defense. Safe Passage, meanwhile, is typically used on defense. It, too, is a card with highly conditional application. At worst, it’s a reactive Fog, while now and again you can make it a blowout since damage to your opponent’s creatures is not prevented. 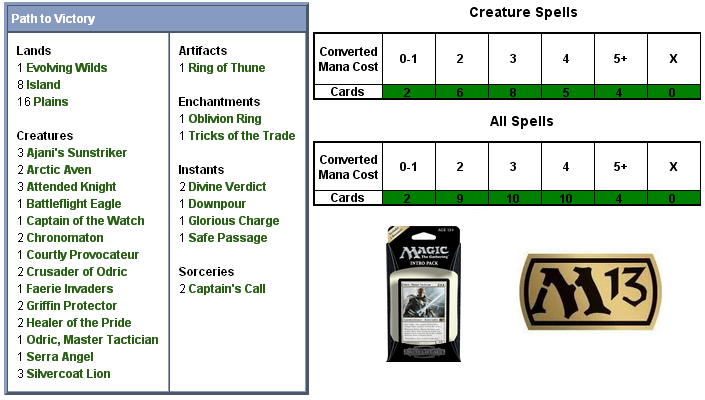 A pair of creature augments are provided by the Ring of Thune and Tricks of the Trade, both new for the set. Tricks of the Trade is a creature aura that gives a power boost and unblockability, useful if the red zone thickens up and you can’t profitably attack. The Ring- the final installment in the Shandalar Ring cycle- brings with it the useful vigilance ability as well as the welcome ability to add +1/+1 counters to any of your White creatures. The last card here is Captain’s Call, an obvious nod to Captain of the Watch. The synergies the Captain afford you are equally present here, and you’ll seldom be at a loss for finding good purpose for a few extra bodies on the battlefield. As with other decks of the series, there’s an Evolving Wilds within for a dose of mana fixing, but other than that it’s all basic lands. We’ll take this final deck into battle before we return with a final verdict in two days. See you then! Curious to see what people think of Odric. I’ve used it in DotP to devastating effect. Combos insanely with Captain of the Watch. Curious to see how it does in the real world with removal. Definitely a “kill it!” creature. Odric is typically a must-answer creature. But, he doesn’t do anything when he enters that battlefield and you have to have at least three other creatures to attack with. That makes him highly conditional. On a Vorthos note, I just read all of the Uncharted Realms articles. They are fantastic. I love reading short stories. More so when they are Magic: The Gathering related. I was sad when Savor the Flavor was discontinued and very sad when Issar Roon died. I am ecstatic that this type of article has been re-established. Yeah. He’s not that hard to keep turned off.